New York Fashion Week may have just ended on Thursday, but I want to do a quick review of some collections that caught my attention. Follow along with me as I break down it from each day of fashion. The collection marked the designer’s 30th anniversary. Azria looked towards 70s California skate and surf culture for inspiration for the collection. It was communicated successfully through board shorts, bucket hats, relaxed silhouettes just to name a few. This collection is very laid back and chilled. Deep beauty in water is the inspiration behind this Spring 2016 collection. There are moments of blue spread throughout the collection. It has a very feminine feel with classic design elements and fabric selection. Overall my favorite looks from the collection would have to be the short dresses and golden sequined top paired with the seashell colored pants. The designer celebrated her 50th anniversary which is quite the accomplishment in the world of fashion. 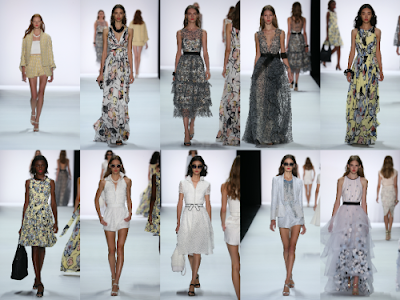 For this collection, Johnson took viewers on a journey down memory lane. She shared memories from life from most recent to the past. One memory, in particular, went back to her childhood dancing days. She incorporated inspiration from her childhood dance costumes throughout the collection. You can’t miss the elements that Johnson is known for such as youthful feel, bright colors, and bold designs. Johnson dedicated the show to her childhood dancing instructor Ann K. Pimm who was in attendance. 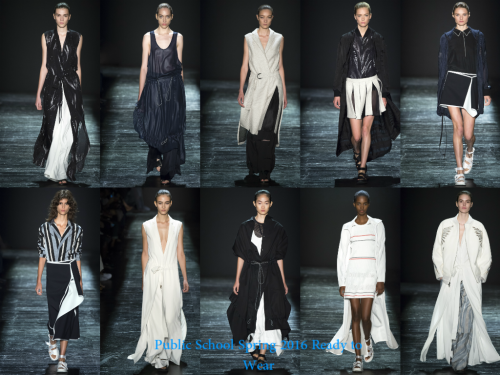 As an alumnus of Academy of Art University, I make it a point to check out the student collection at New York Fashion Week. This time around I chose to focus on two of their collections. 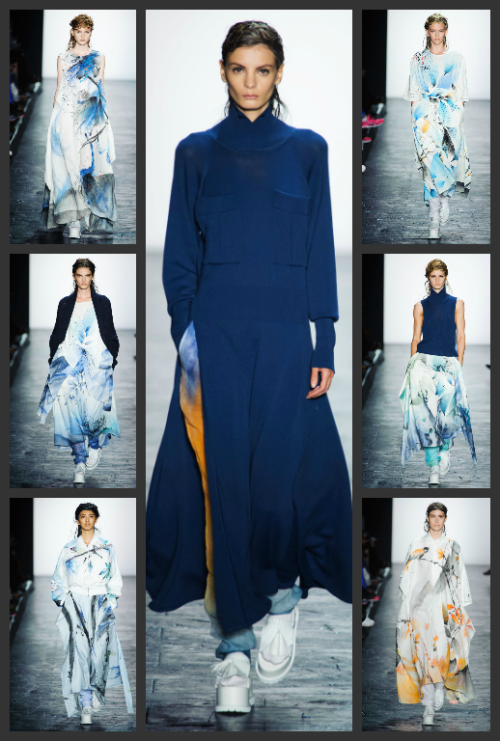 Kim was inspired by traditional Chinese painting as well as by modern art. The designer celebrated his 30th anniversary of this label. The collection didn’t divert from the standard look of the label we have come to expect. 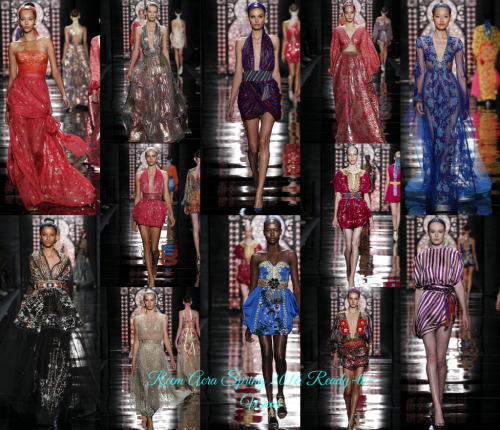 What caught my eye is the detailing especially the geometric designs featured on a good portion of the looks in this collection. For the ladies who aren’t afraid of color, this is the collection for you. I can definitely see some of the looks being worn to a garden party or more formal social events. The design duo made use of a largely neutral tone color palette which didn’t take away from the overall design of the collection. It was a very cohesive collection. 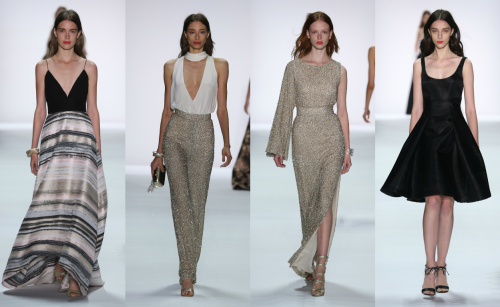 What I liked about this collection is the transition of lengths of the gowns that are featured. 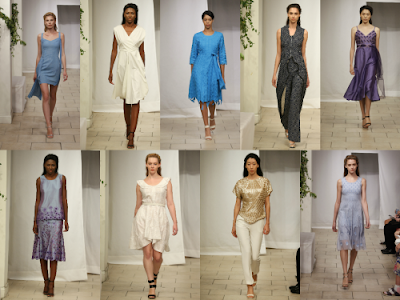 For Packham fans, you have the options whether you are tea length or floor length gown. Another design choice that stood out is the solid and beaded selections. I wasn’t familiar with this label previously, but this year’s collection piqued my interest. I am a fan of the use of pastel and different shades of blues. Personally, I am not a fur fan so the inclusion in some looks (as a fanny pack and pom-pom stoles) weren’t my favorite. However, that’s just my opinion. Fur fans and wearers are sure to love it. 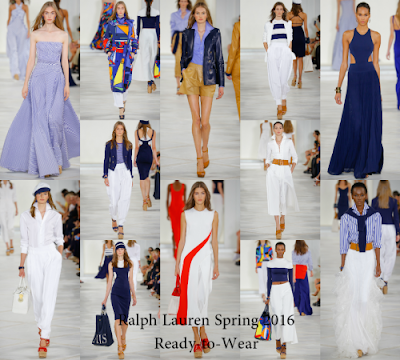 The designer transported viewers to the island vacation with his spring 2016 collection. With the combination of swimsuits and casual looks, you feel the laidback feel of Hilfiger is going for. We also get to see hints of the Rasta influence (knitted bucket hats and color scheme) without it being too heavy handed. Sundresses are my favorite designs of the collection. Fresh off the VMAs last month, Jeremy Scott takes us back to the 60s while meeting the eighties. This 60s is one of my favorite fashion decades. Between the exaggerated sixties, updos and bold colors and prints Scott made sure this collection would have people talking. It was definitely interesting how his was able to mesh elements from both decades without one overpowering the other. This is collection was my favorite of the day and with good reason. The designer drew inspiration from her Middle Eastern heritage and travels. 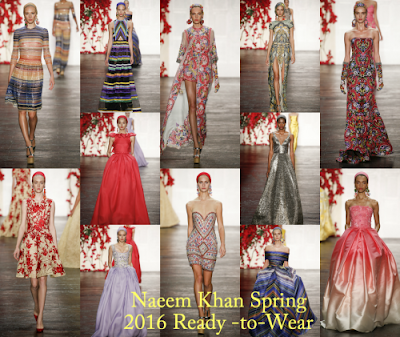 I loved the rich colors, traditional Middle Eastern beading and the inclusions of belts. Each design was so diverse especially the floral variety. I am usually not the biggest floral fan, but here they were done so well. The design duo gave their unique take on floral, solids and baby sequins which were my favorite. 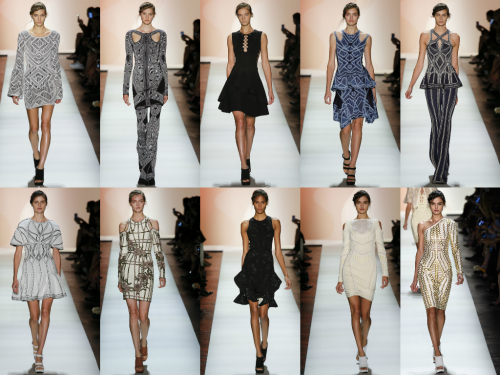 This collection is perfect for an evening on the town. It definitely had a youthful yet sophisticated appeal. The designers are on trend with the inclusions of short suits which is constantly popular each season. 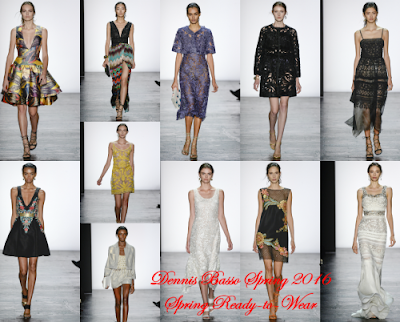 I am a fan of full skirts so when I see that Dennis Basso included them on a few of their dress I couldn’t have been happier. The stars of this collection are the printed and multi-color looks. Khan was inspired by the gardens in the south of France. 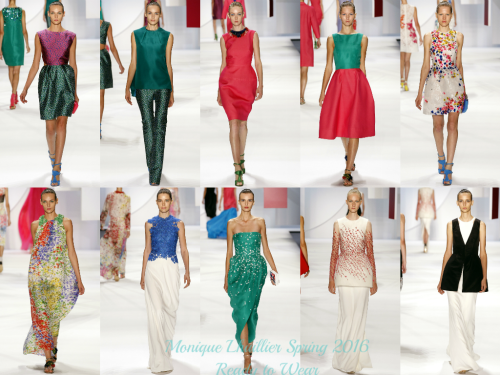 This collection was gorgeous from the different dress silhouettes to the energetic color palette. I think it was a great decision on the designer’s part to choose this color palette because it really makes the designs popped. 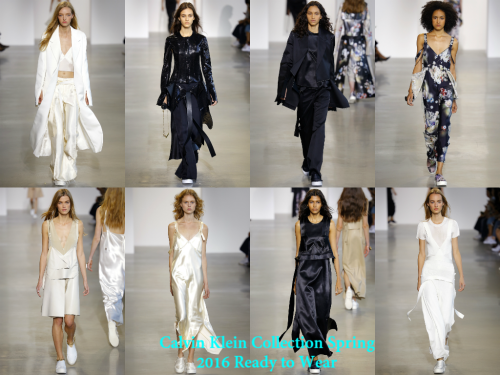 I was curious to see this collection after Donna Karan stepped downed as the chief designer of Donna Karan Inc. What I gathered from this collection is business influenced with pinstripes, blazers, and shirts. The design duo was careful to demonstrate their direction while still giving a nod to Karan herself. 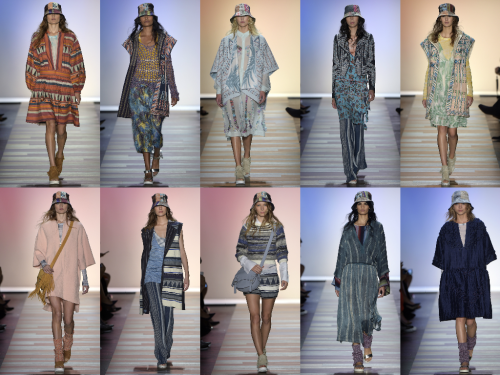 The first thing I noticed about this collection is the nautical influence (stripes, sailboat print, and color palette) all the way through. Lauren also was largely influenced by Franco fashion. The collection is ideal for a day on the boat or a short sailing trip. These looks can be worn for a boat party. 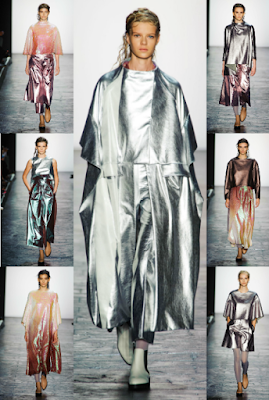 According to WWD, Creative Director Francisco Costa titled this collection The Morning After which makes sense after viewing it. A few of the looks could double as lingerie without a problem. On the opposite end of the collection, you have darker looks which played up the grunge influence which was widely popular in the early 90s. Somehow these combating influences worked like night and day which what Costa may have been going for. If this is actually true then he definitely succeeded. Well, that’s all from New York Fashion Week. 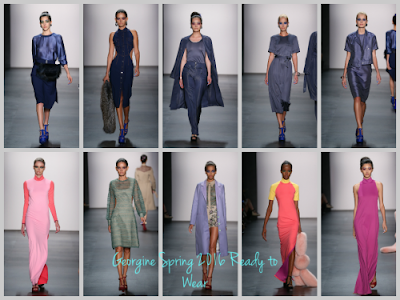 Stay tuned as I recap London Fashion Week and all things in fashion.